1. Bee sure to start sentences with a capital letter. 2. Bee sure to start proper nouns with a capital letter. 3. 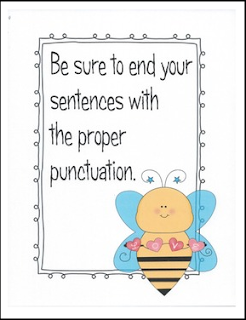 Bee sure that your sentence tells a complete thought. Sentences need to make sense. 4. Bee sure that you end your sentences with proper punctuation. All of the posters have adorable bee clip art on them!